The death toll for Americans in Iraq reached 4,000 on Sunday. “It’s a sober moment, and one that all of us can focus on in terms of the number.… The president feels each and every one of the deaths very strongly and he grieves for their families. He obviously is grieved by the moment but he mourns the loss of every single life.” Or at least that is what one of his surrogates reported as President Bush himself was too busy entertaining the Easter Bunny on the South Lawn of the White House to acknowledge and address the gravity of the moment. The number of U.S. casualties is really rather hard to get a handle on, and the administration treat it as something of a shell game. When it is pointed out that we have reached something of a milestone with 4,000 deaths there is an effort to deflect the magnitude of the number by mourning “every single life”; when attention is turned to individual deaths the focus shifts to how the overall number of deaths has slowed since the beginning of the “surge” or how, as Vice President Cheney emphasized today, “every casualty, every loss” had joined the military voluntarily (as if that somehow mitigates the tragedy of their loss or soothes the pain of their families and friends). Of course, visually representing the relationship between individual and collective is always a vexing problem. Since social and political collectives are corporate entities constituted by more than the sum of their parts, it is difficult to put the whole on display in any demonstrably real or objective manner. All we can ever really show is a part that presumably stands in for the whole, such as when large groups of people saluting the flag stand in for “the American people.” The typical strategy for representing the collective is through opinion polls or charts and graphs which aggregate individuals into statistical displays. The problem with this approach, of course, is that it removes all sense of the individual from the equation, literally reducing people(s) to abstract numbers. So it is that we can report that the average American family includes 2.6 children. 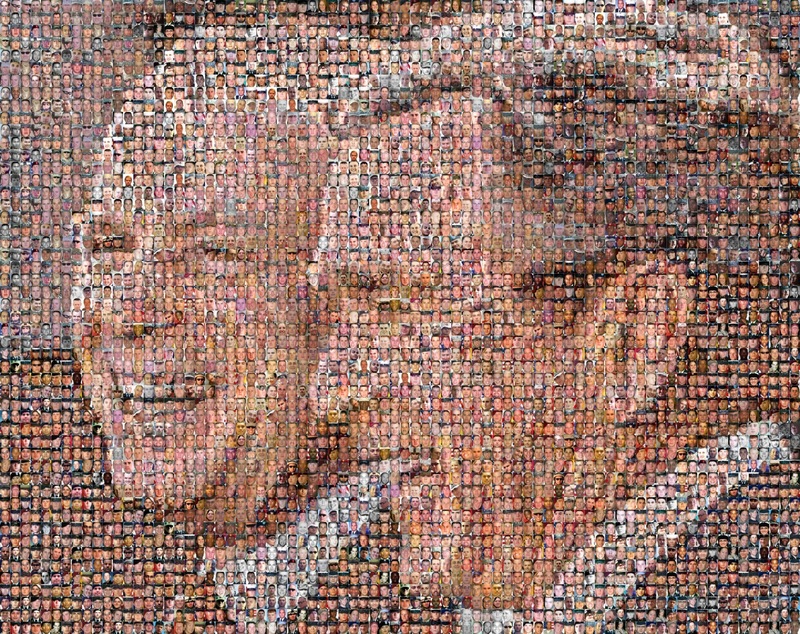 The NYT has addressed this problem inventively with a graphic representation that literally “puts a face” on war casualties in a manner that imbricates individual and collective losses in an interactive image that holds each in a kind of suspended animation, both the “one” and the “many” present at the same time with neither yielding their magnitude or significance to the other. 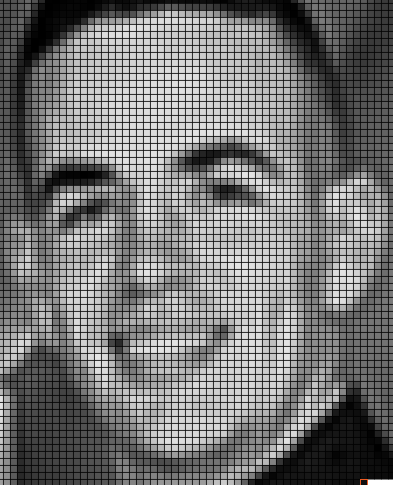 What we have above is a photo/graphic representation of David Stelmate, U.S. Army, age 27, who died on March 22, 2008. 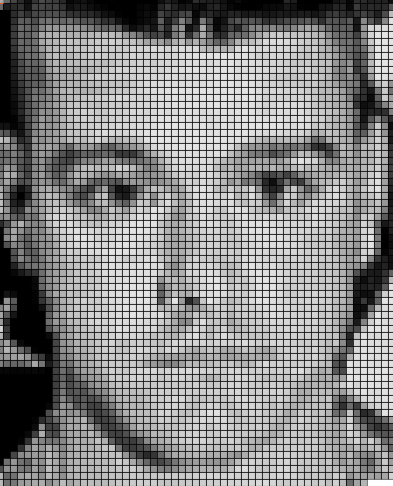 His face is made up of 4,000 squares, each one representing one of the other 3,999 U.S. deaths since the beginning of the invasion and occupation five years ago. When you click on any single square the name of one of those others appears; if you double click on it the large image changes to that individual. Below, for example is Jay T. Aubin, age 37, a U.S. Marine who was among the very first to die on March 21, 2003. To get to his image you would double click on the first block in the lower right hand corner of the graphic. To see how it works click on either the image above or below. Looking at these “faces of death” is excruciatingly difficult, all the more so when we condition ourselves to recognize how each demands that we take account–and responsibility–for the combined magnitude of individual and collective loss simultaneously. These are not just 4,000 Americans, but also and simultaneously 4,000 individuals: husbands and wives, mothers and fathers, sons and daughters, sisters and brothers, friends and, yes, even strangers. And as you gaze upon these faces what you need to acknowledge is that even though the “number” of American deaths in Iraq has gone down since the surge, we are still losing American lives at the rate of “one a day” and there does not appear to be an end in sight. 4,000 American deaths–and lord knows how many Iraqis; a “sobering moment” indeed. Note: For a non-interactive variation on the this visual theme that uses the faces of the dead to create a mosaic that underscores both the magnitude of the collective loss and emphasizes cupability, see this representation at the Huffington Post. My thoughts exactly. And remember the further cost: there have been more than 29,000 non-fatal casualties as well. And the casualties/causality spreads further. Suicides among serving Iraq vets, and child neglect and abuse in military families, has risen spectacularly. The narrative form of this moral disaster is sketched so very clearly in Paul Haggis’ movie, In the Valley of Elah.